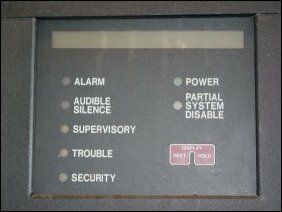 You never know when the building’s going to start to fall apart. 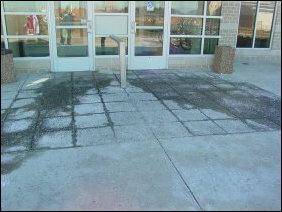 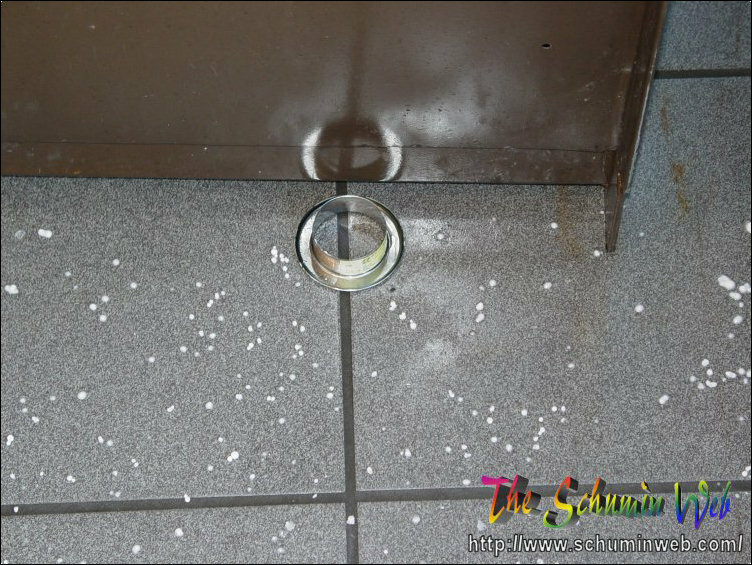 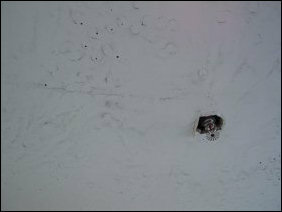 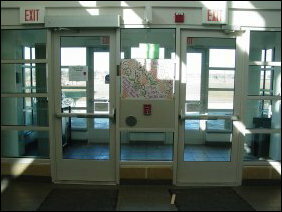 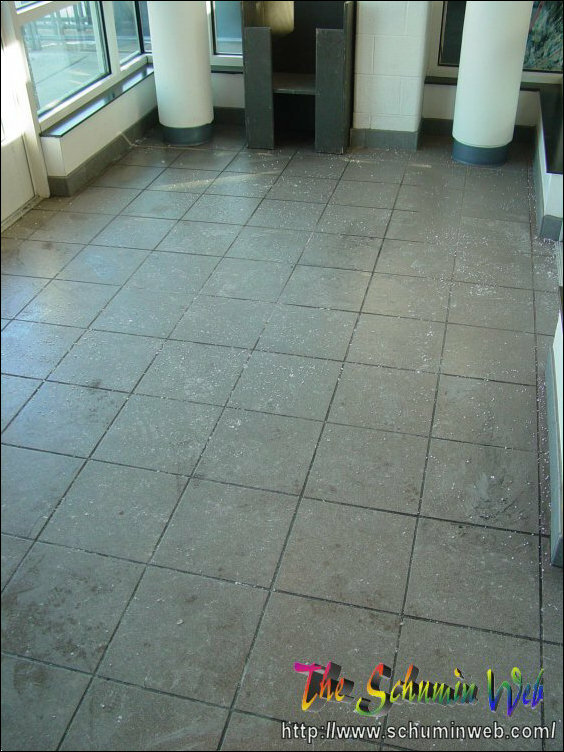 In this case, on January 24, 2003, during a period of extreme cold (actual temperatures in the single digits, wind chill of well below zero), we had a sprinkler pipe burst in the main entry foyer, causing a lot of damage and problems. 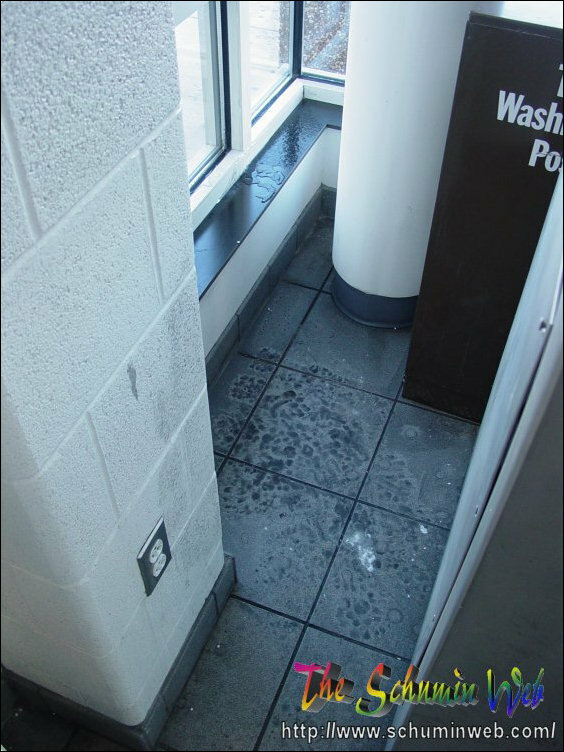 What you’re seeing in this photo set is the aftermath of the event, taken the morning after, after the emergency maintenance crew had stopped the immediate hazards of water and ice and electrical mayhem, as well as the following Tuesday, after some repairs were made. 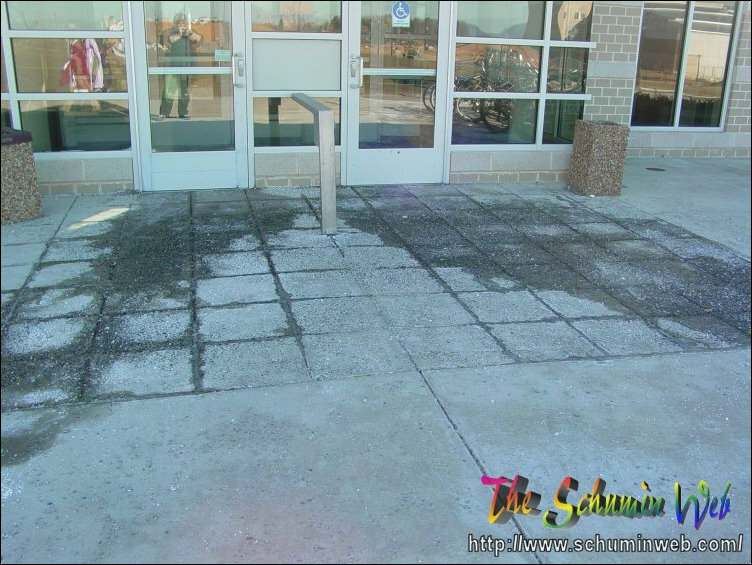 First of all, outside the entry foyer, you can get a feel for how much water was flowing out of the one burst sprinkler by looking at the water flows. As you can see, this was no small flood! 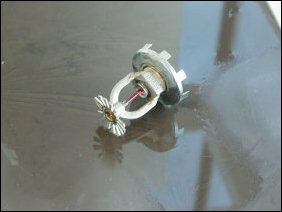 The sprinkler head itself could be found nearby – the decorative ring could be found on the floor next to the newspaper box, and the intact sprinkler head itself could be found on top of the newspaper box. I was amazed that the sprinkler head remained intact. 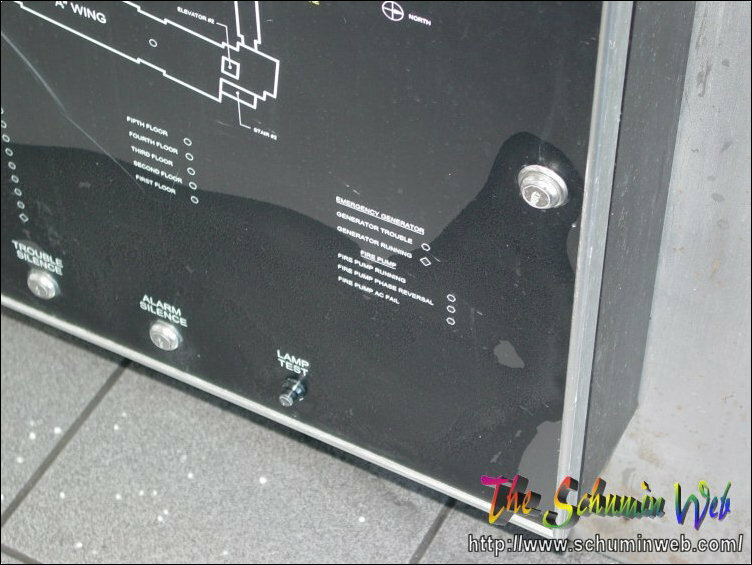 I’d have expected the red glass rod to have broken off. 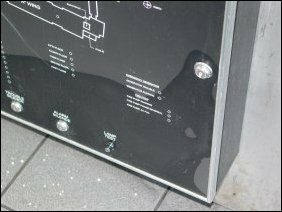 Along with the annunciator, the panel itself also took on enough water to short-circuit, making it necessary to disconnect it. 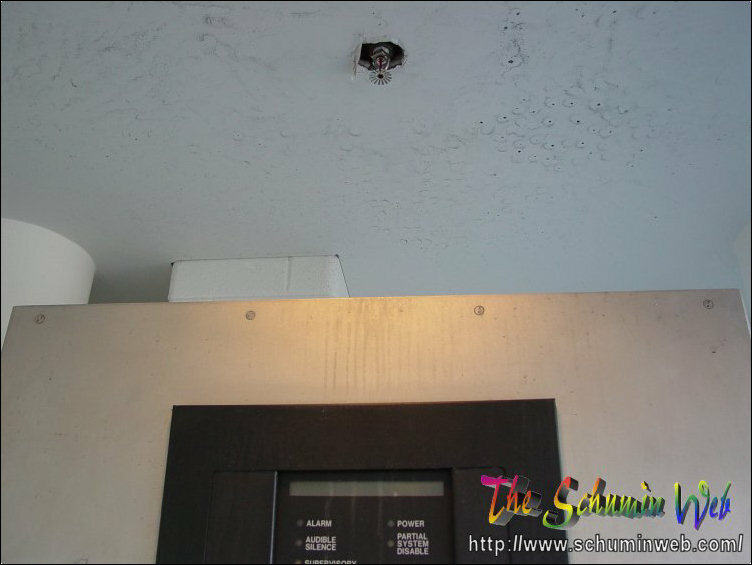 Thankfully, though, there is a second panel in a mechanical room, so this didn’t kill the fire alarm system – just the more-convenient of the two panels. 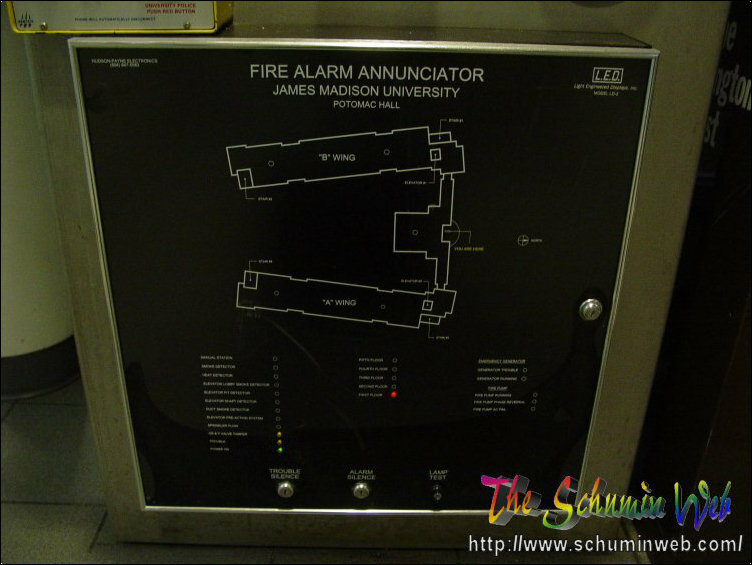 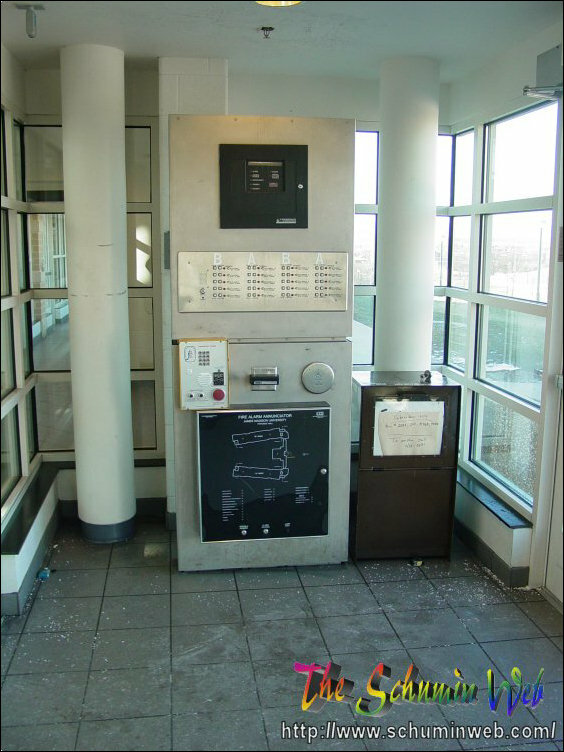 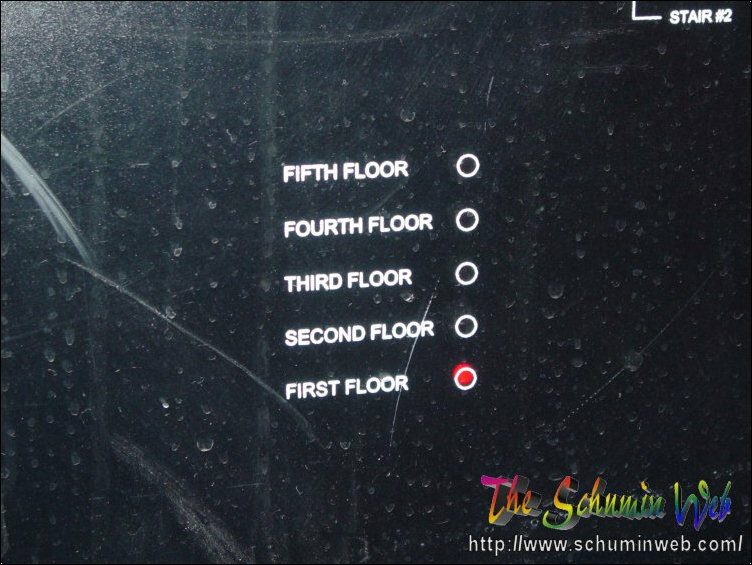 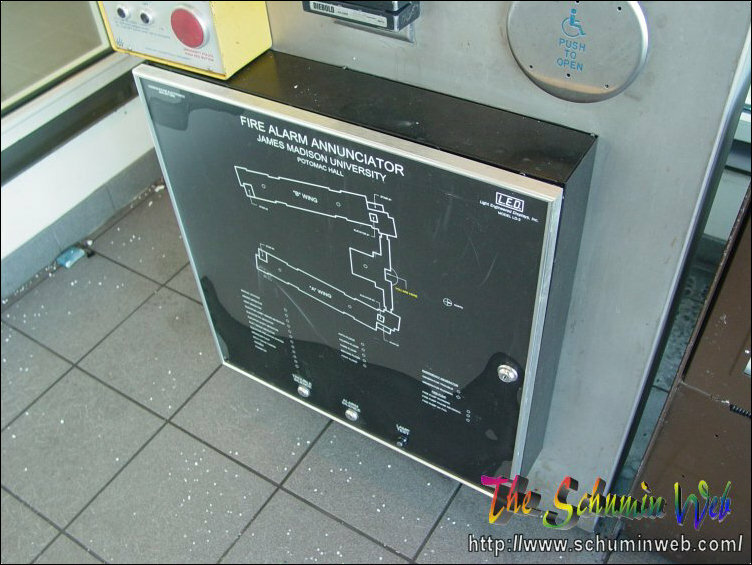 To disconnect the annunciator and the panel, maintenance had to shut down the entire fire alarm system, disconnect the stuff, then restart the fire alarm system and quickly test it – causing me to get a bunch of IMs from residents wanting to know what was going on. 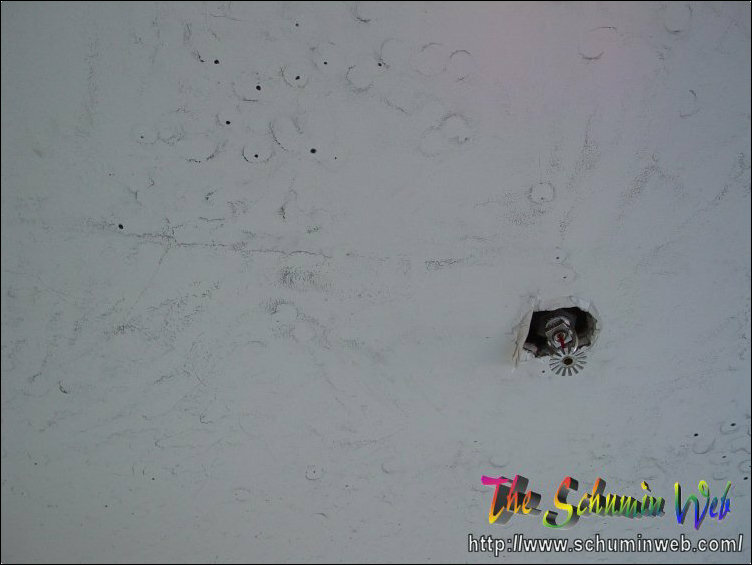 On the ceiling near the sprinkler head in question, there was a lot of oily residue on the ceiling from the grease that was used inside the sprinkler to make a good seal. 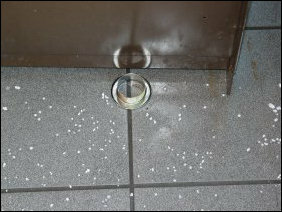 This also lent a certain “oily” kind of a smell. 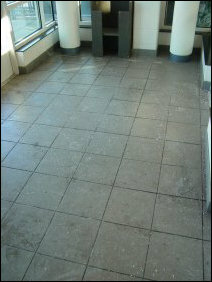 Behind the panel, the floor was covered with sprinkler grease, and even a little ice. 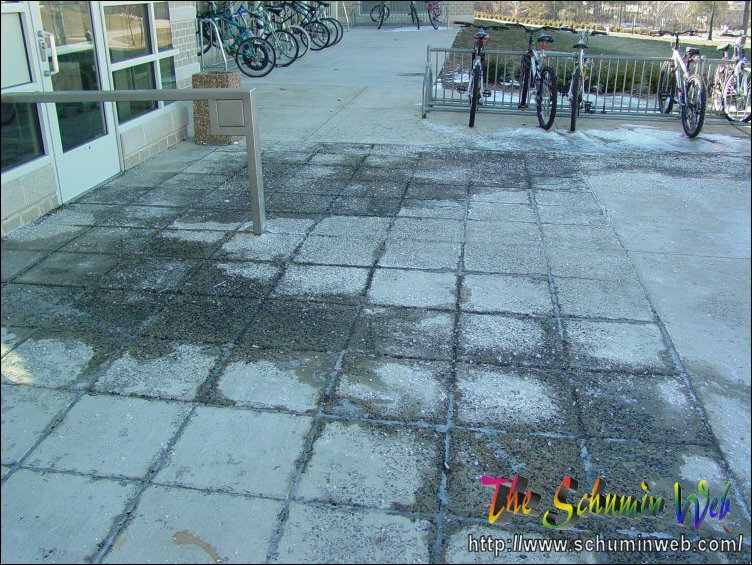 Most of the floor was covered with salt, in order to prevent the floor from freezing over while there was water on it. This was in addition to residue from the sprinkler grease and people tracking whatever else in. 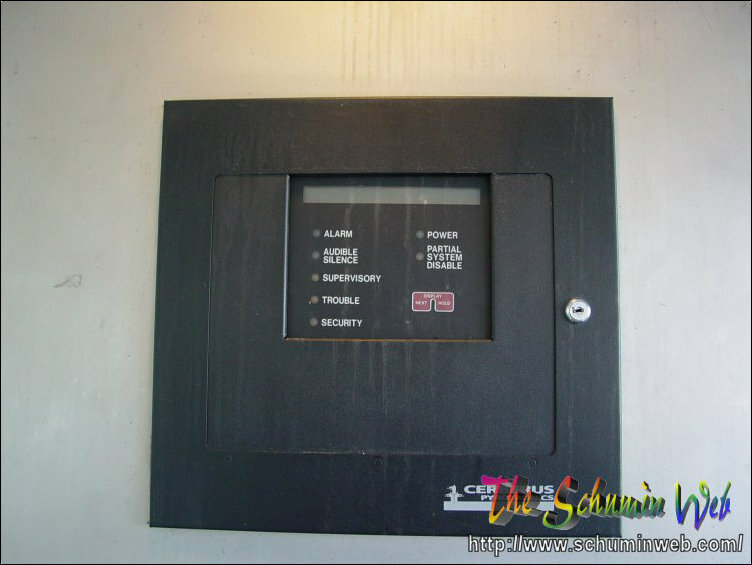 The following Tuesday, maintenance returned and made the fire alarm panel in the front operational again, cleaning out the water and making sure everything was correct inside of the panel and the annunciator. 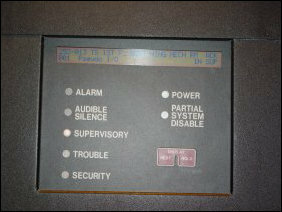 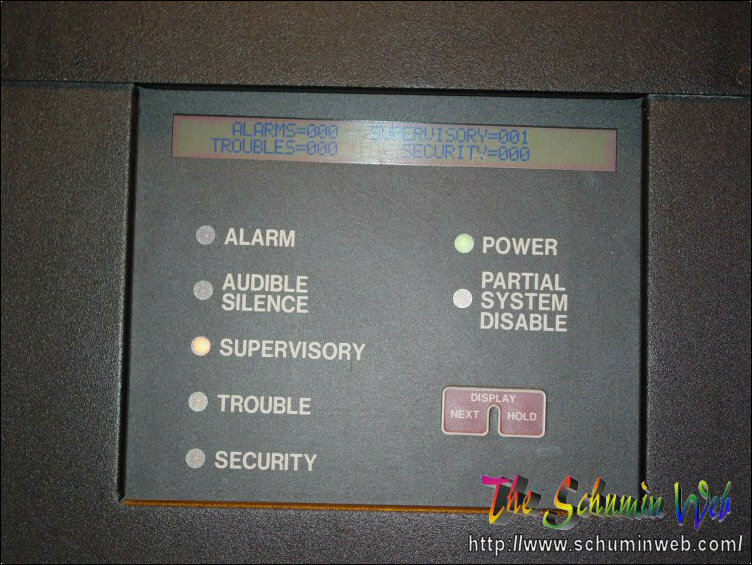 Interestingly enough, the alarm system was showing a “Supervisory” condition after the front panel was reconnected, and the screen, instead of the usual date, time, and location, showed what was going on in Supervisory mode. 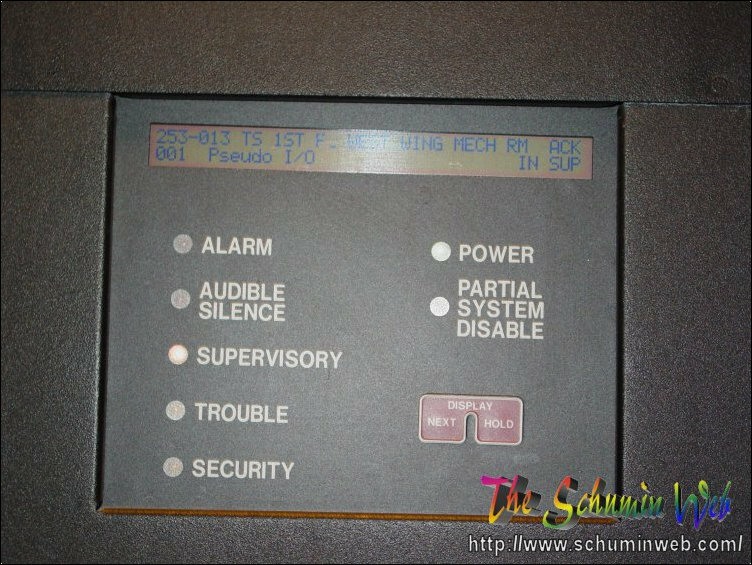 Click the images above to get a better look at what the panel was showing on the screen. Note: “WEST WING MECH RM” as shown in the right image is the room where the other FACP is located, and is where the sprinkler system valve to cut off the water to the pipes is. 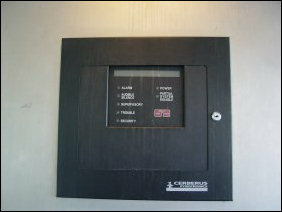 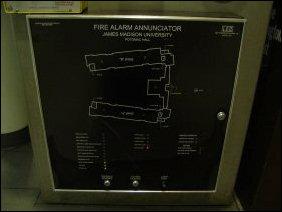 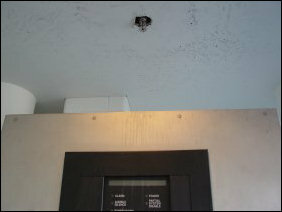 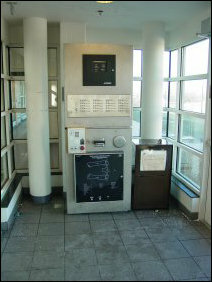 The fire alarm system monitors the status of the valve. 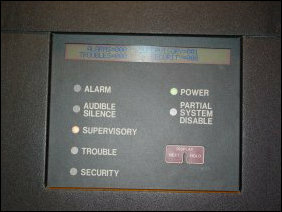 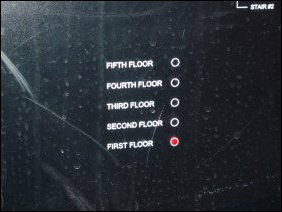 The graphic annunciator was also lit up, showing a “Trouble” condition. 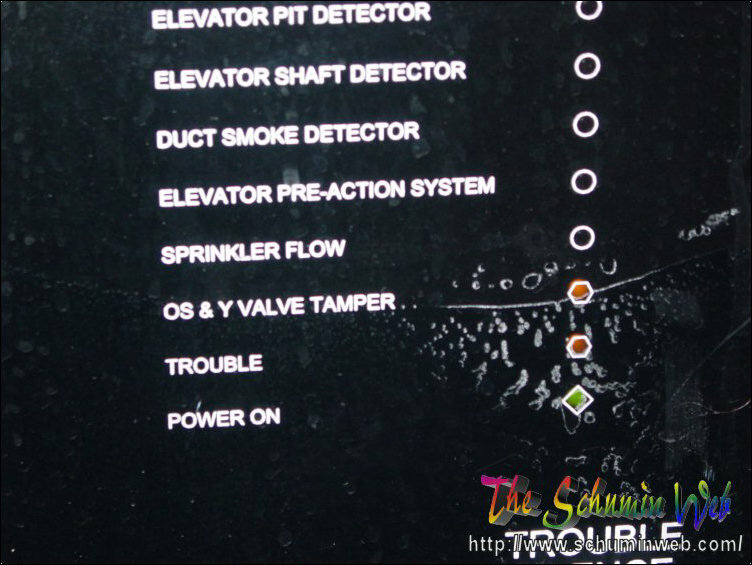 It showed a trouble condition on the first floor, on the “OS & Y Valve Tamper”. 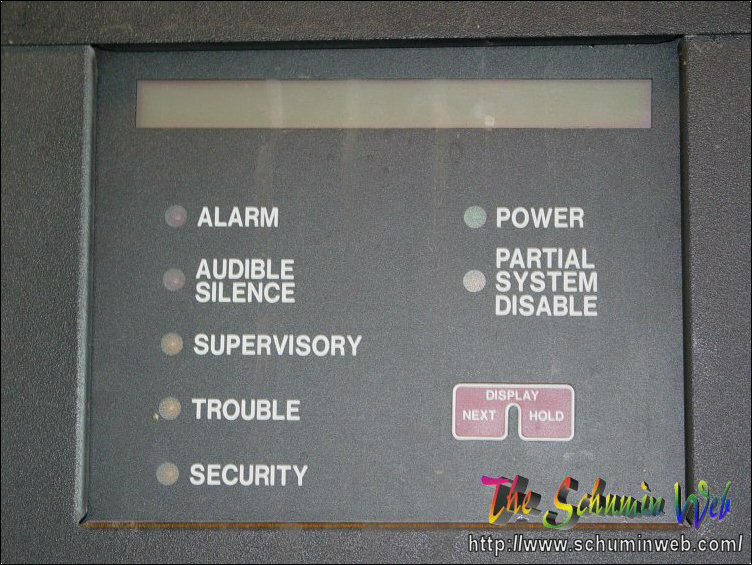 All I have to say, though, is that I’m glad that the panel is back in order… it was indeed missed during its three-day absence.